There are lots of sporadic mentions of Thai salads on LTH but I thought they deserve their own thread. To my mind, the Thai's really have the concept of a salad down pat. 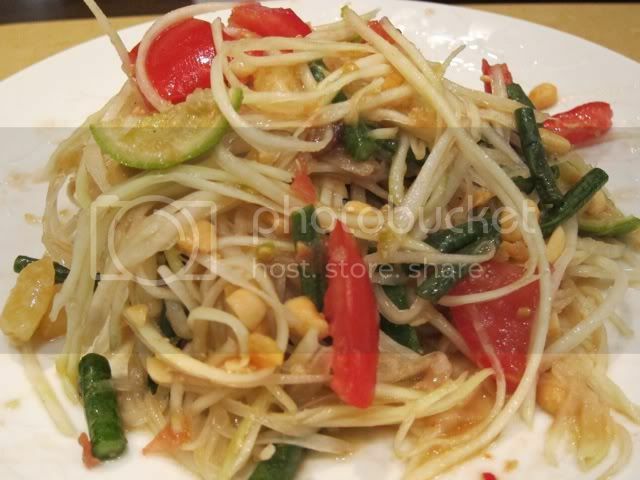 Thai salads rarely feature lettuce (except as a garnish). I have nothing against lettuce, but substituting say, pork, for lettuce is a definite improvement in my book. 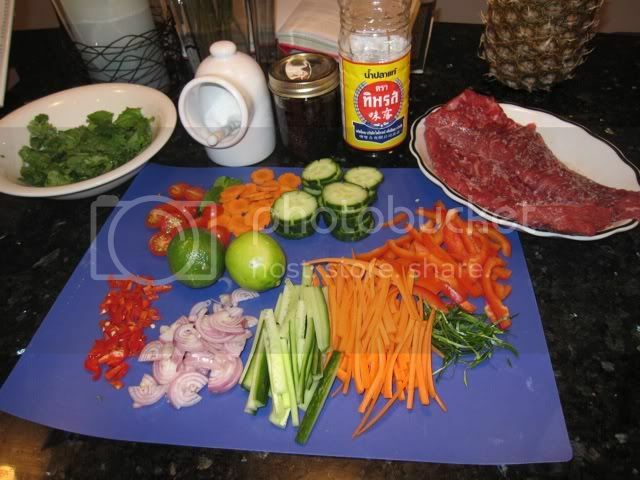 In the summer, we probably have a Thai or 'Thai-ish' salad about once a week. 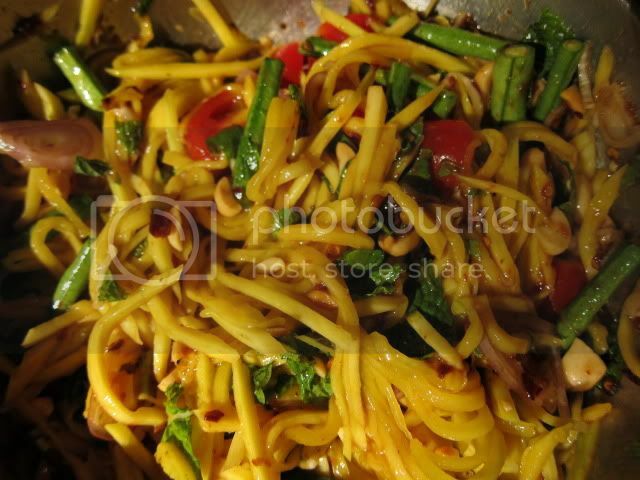 You can pretty much throw together meat/seafood/crunchy vegetables of your choice, add some cashews/peanuts, and dress with fish sauce/lime juice/sugar, add some chopped mint/cilantro/thai basil/minced lemongrass and off course chiles and viola! Here are some faves and recent random Thai salads. I have made boudreaulicious's Thai apple salad many times since she posted the recipe after last years picnic. 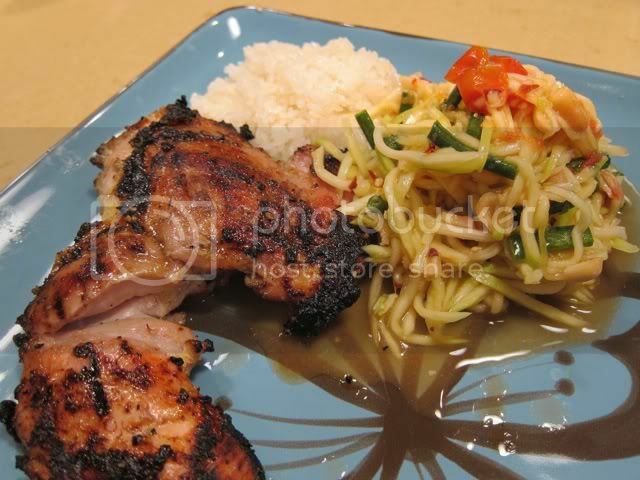 It never fails to get rave reviews and I've sent the recipe link to several friends upon request. 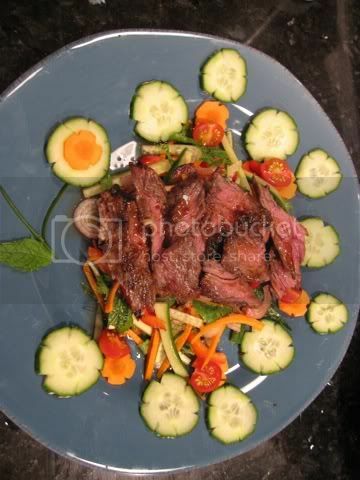 JoelF first posted a recipe for Thai steak salad (Neua nam tok) on LTH and I made his recipe for the 1000 recipe potluck salad. 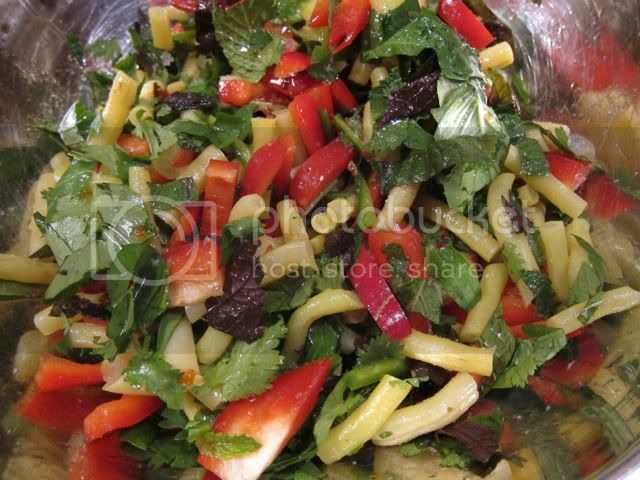 It's one of my favorite summer salads. 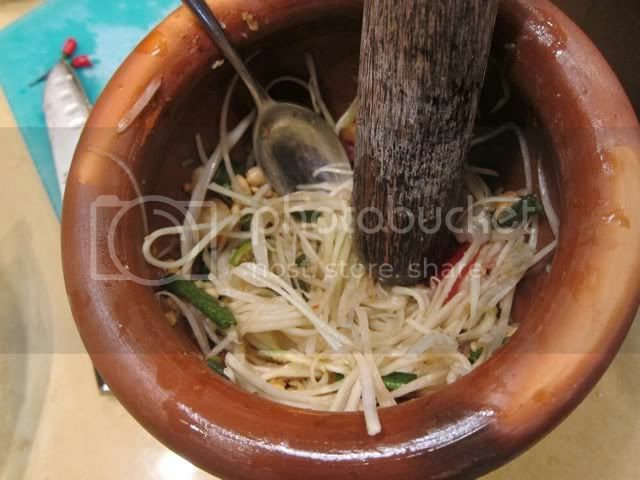 I make a lot of som tum (papaya salad). I can't quite get it to have the same flavor profile as Aroy's som tum Thai (my benchmark) but it's still good. Recently, I planned to make a green mango salad but I waited too long and the green mango got a little ripe. It was still good. 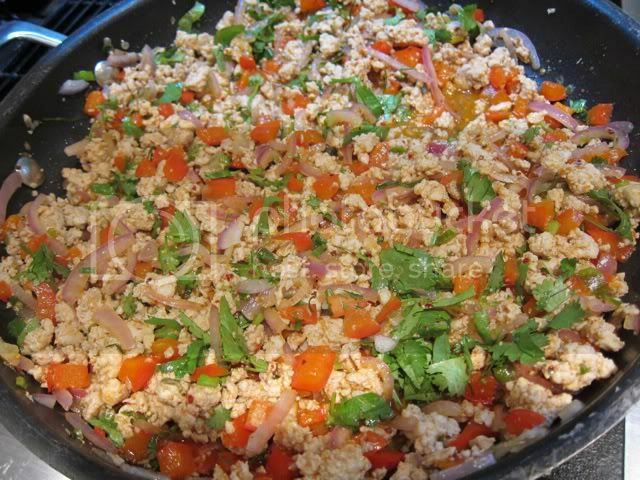 I make larb with ground pork (or chicken). The Lobo flavoring packets (which include ground toasted rice) make this a super fast weeknight meal when I'm short on time. 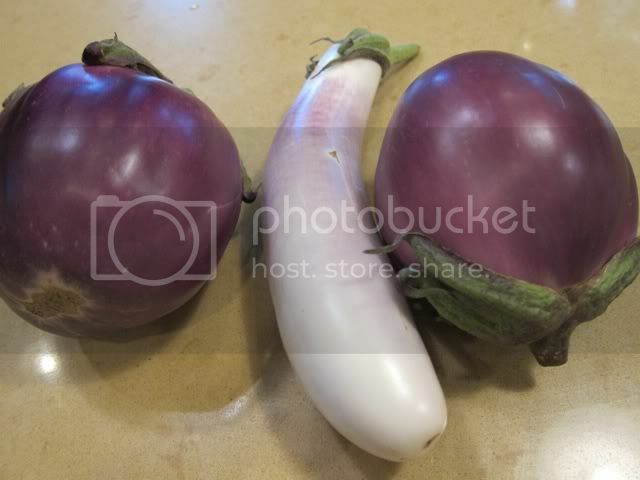 I'm planning to make some Thai eggplant salad with the yield from my garden this year. KennyZ posted on a version of this with trout. Other favorites: grilled shrimp salad with lemongrass, banana blossom salad (kind of a work in progress), pomelo salad and yam woon sen (bean thread noodle salad). Anyone else have Thai salad faves? Perhaps my very favourite yum, heck one of my favourite dishes in the entire cuisine, is yum pla duk foo (crispy catfish green mango salad). It's unlikely that I'll stank up my place to deep-fry the shredded fish, but fortunately I have a few good restaurant versions available to me here. Wonder if you guys see the pre-fried fish in your local Thai markets ? When I get the dish to-go from a local restaurant here, they supply me with about 3x as much fish as salad, so that comes in handy. 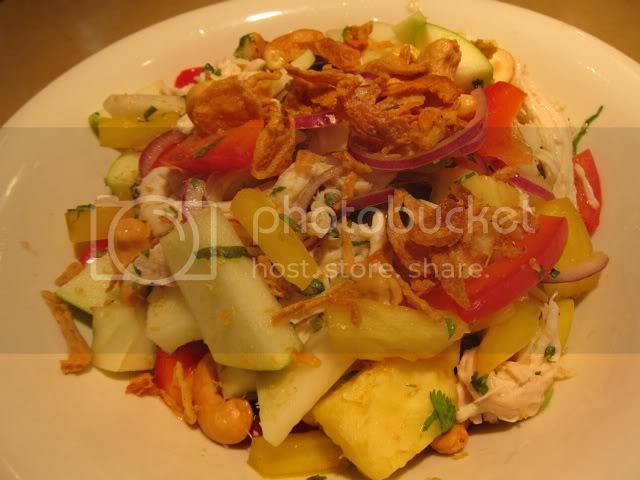 Are there any favorite cookbooks on Thai salads? 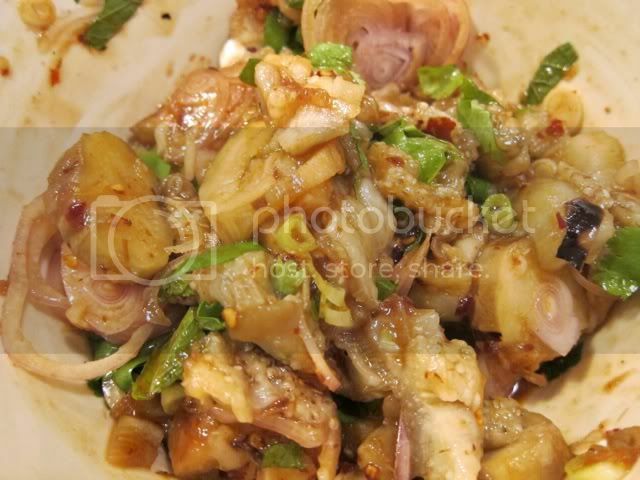 I've been working on a "ghetto" banana blossom salad recipe, using Durkee Fried Onions and canned artichokes, rather than actual banana blossom and crisp-fried shallots. Chris Koetke of Kendall College has a television show called Let's Dish. I caught part of an episode related to Thai cooking, which included two salads. I have to admit the mortar and pestal resting on the glass cooktop, I was waiting for something to break. 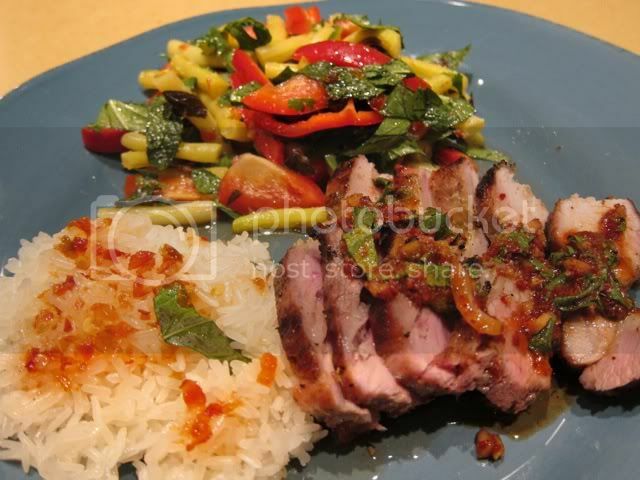 lougord99 wrote: Are there any favorite cookbooks on Thai salads? I don't know of any cookbooks specifically on salads. David Thompson's Thai Food cookbook has lots of interesting salads but his recipes tend towards the time intensive and are packed with hard to find ingredients. I have tended to use my cookbooks as more of a jumping off point. For salad inspiration, I like Nancy McDermott's Real Thai, The Elegant Taste of Thai Food: Foods of the Cha Am province and Hot Sour Salty Sweet by Alford/Duguid (to name a few). 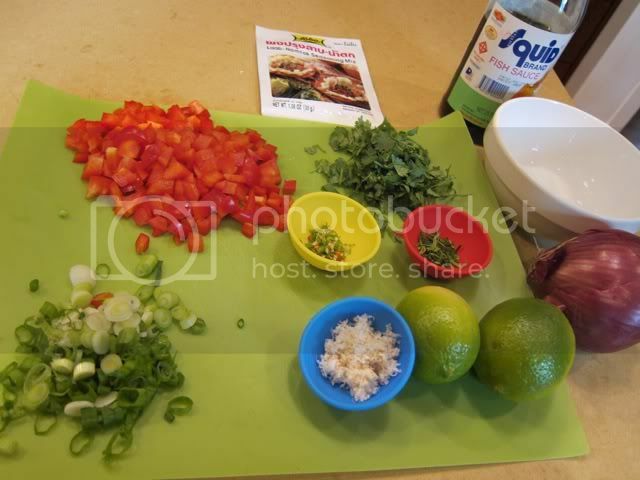 Thanks for posting--this motivated me to make Som Tam for dinner tonight and use two of their tips--'muddling' pieces of whole lime with the salad and adding tamarind. 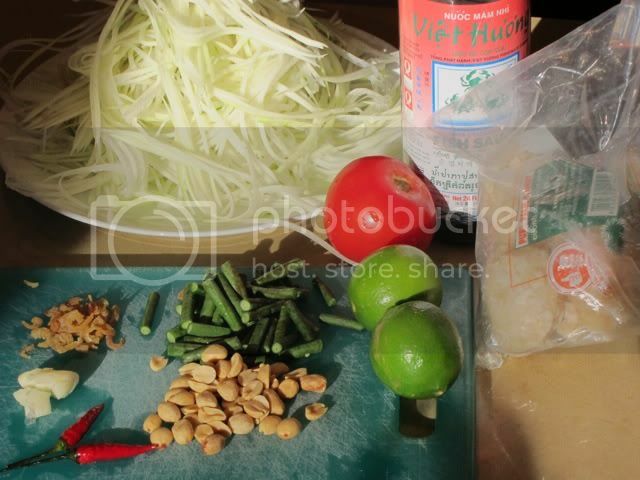 These will definitely be part of my future Som Tam preparations. I can't stand canned artichokes and have had no luck finding frozen. Any leads? Frozen artichokes are available at both Trader Joe's and Treasure Island. You have both stores relatively close to your posted location in Roscoe Village. The TJ frozen artichokes are hearts, not bottoms, i.e. have the leaves, Birdseye also sells frozen artichoke hearts. 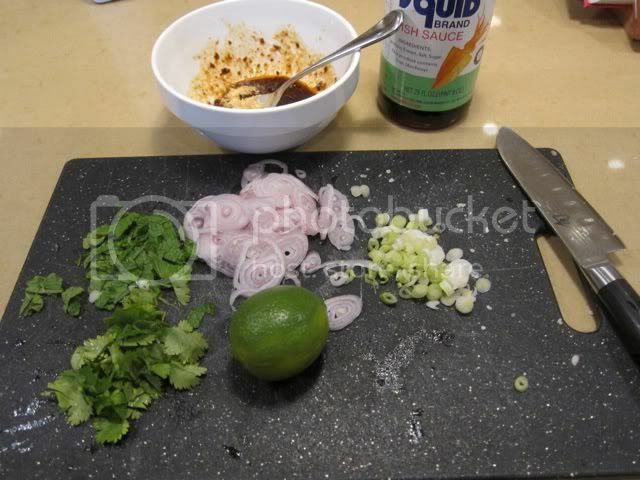 Not authentic by any stretch but I like raw bay scallops dressed with a thai style dressing of lime juice, fish sauce, palm sugar, garlic and lots of scuds and then tossed with cilantro, red onion and mango. 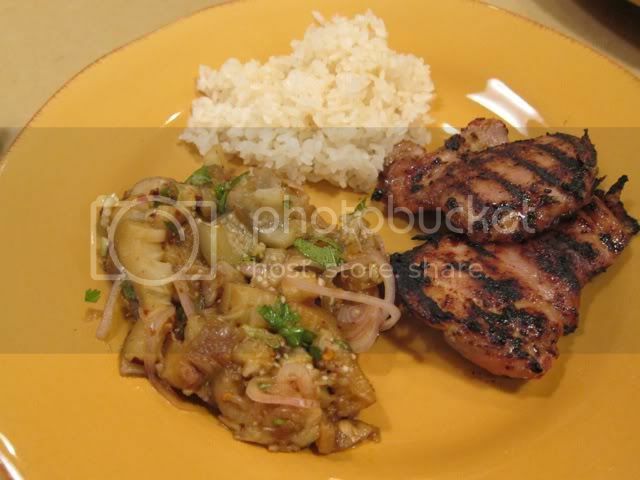 We made Thai eggplant salad (Yam Makeua) as an accompaniment to Thai grilled chicken thighs (a riff on the fantastic recipe posted by BrendanR) and sticky rice (well, not-so-sticky rice since we were too impatient to wait for it to finish steaming). I really like these little palm sugar disks they have at Golden Pacific--the size is more convenient than the bigger ones I'd been using previously. One smash with a mallet and voila--nice soft palm sugar. 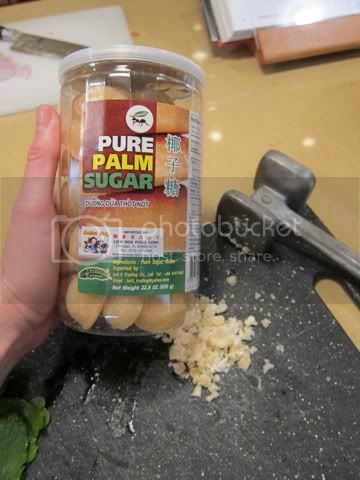 thanks for the tip on the palm sugar discs, mine always hardens into large chunks of solid rock, requiring an ice pick to dislodge useable chunks. 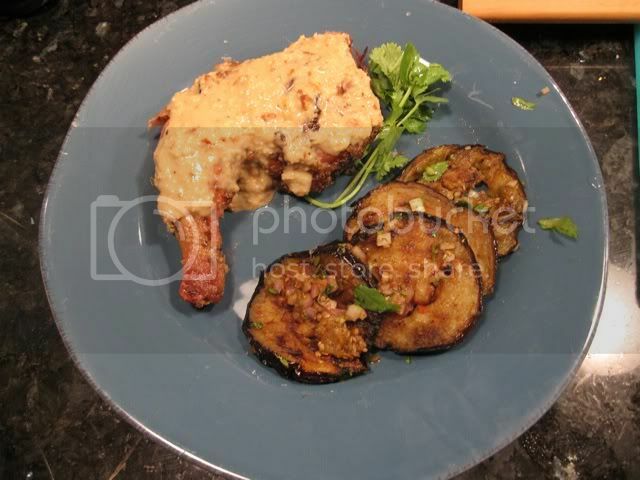 the eggplant salad is a favorite of mine - a few notes - I've heard of a few different types of eggplant being used for these: the white eggplants I am told are what they use at Aroy, and i've seen them use the long green eggplants (similar to japanese, but slightly fatter, and well. . .green) at TAC. 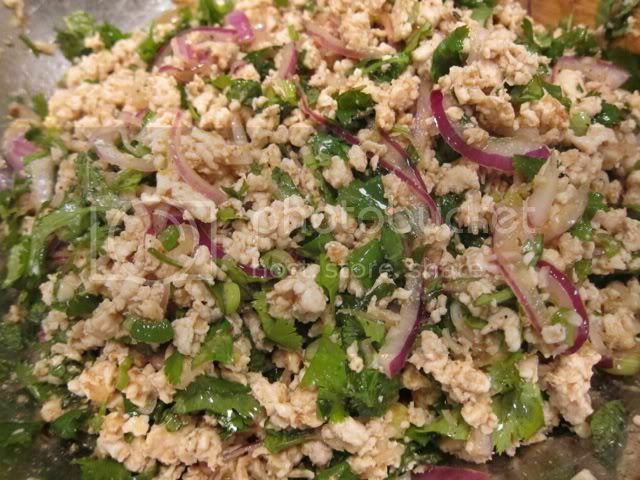 at a number of spots I've seen sesame seeds used in topping this dish (which always surprised me, because I don't see it often in other thai dishes - sort of like cauliflower's appearance in a number of Gaeng Som's and nowehere else), which Iv'e taken to doing. I also like a little mint in the greenery mix. Are you movin' in on my Food Desert Project, Joel? Seriously, let me know if you get something, I've been playing around with various canned vegetables to try to get a Thai or Vietnamese-style salad, and just haven't got it right yet. Maybe blanching the artichokes? Ok, now I feel the gauntlet is thrown. I may have to show up with this at the picnic. I'm not sure I can do it entirely food-desert-style: there's no substitute for some of the other fresh ingredients. My main impetus is that banana blossoms aren't the easiest item to find (and are a heck of a lot of labor for not a lot of food value, due to the need to dispose of all the baby nanners), and that frying the shallots is also a high-labor and high-mess step that the canned items would cut short. 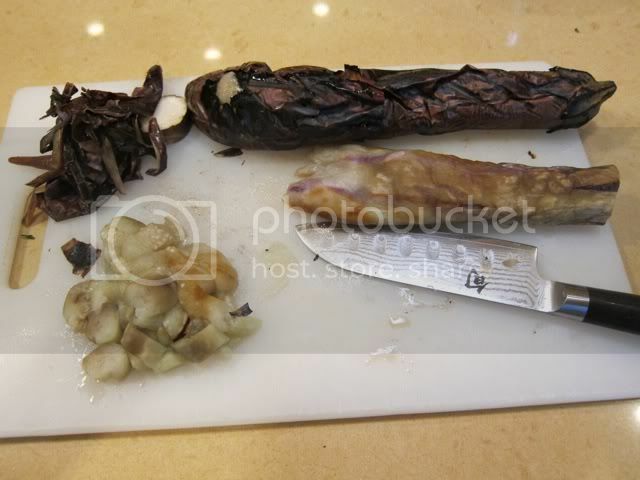 JoelF wrote: My main impetus is that banana blossoms aren't the easiest item to find (and are a heck of a lot of labor for not a lot of food value, due to the need to dispose of all the baby nanners), . . .
Can't help you much on the labor front, but if you do venture into the city, you can find fresh banana blossoms at Golden Pacific on Broadway. They are also nearly always available at Marketplace on Oakton, as well. I've been increasingly replacing the papaya in my som tum with green mango. I like the texture and flavor a little better. Had banana blossoms at the new Mariano's in Roscoe Village at opening. Don't remember the price or not sure if a regular item. I remember seeing them and going: "Wha?" They are also regularly at Fresh Farms in Niles. I had a bunch of veggies in the fridge from our CSA plus a bunch of herbs left over from a Vietnamese dish and decided to combine everything for a 'Thai' salad. After sampling a terrific wing bean salad at My Choice in Bangkok, we decided to try and replicate this at home. We found wing beans at Golden Pacific--they don't have a great shelf life and were a little saggy after a day in the fridge but they worked well. 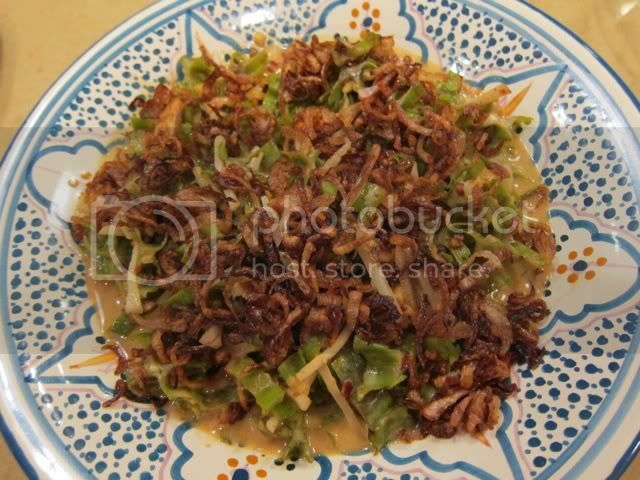 The salad is composed of toasted, julienned coconut, blanched wing beans, a dressing of coconut milk, palm sugar, fish sauce, lime, and Thai chili jam (nam prik pao), then topped with crispy fried shallots. I have to work on the dressing balance a little (I added a little too much lime juice to this batch), but overall, I thought this was a big success. 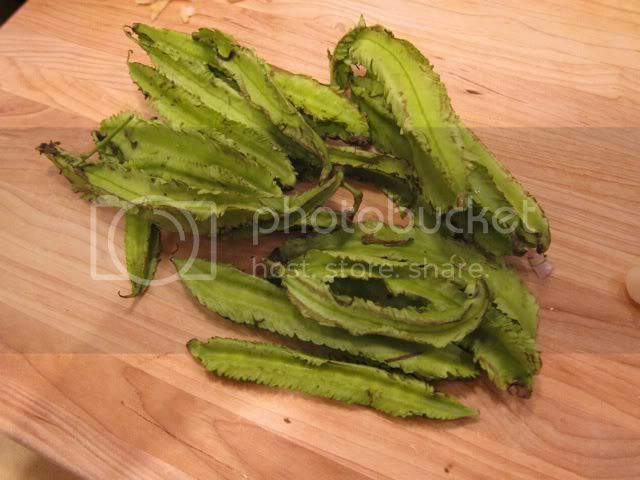 I'm considering trying to grow wing beans in the garden this summer. Has anyone tried this? I'm considering trying to grow wing beans in the garden this summer. Has anyone tried this? I'd be willing to try, though it seems it might do better in a warmer climate. Do you have a reasonable source for seeds? Intrigued by a vegetable that I have never seen before, I did a little research on them. While the seeds are readily available, the plant appear to be day length sensitive for production and do not really produce until daylight is decreasing in late summer to early fall. I saw some discussion of potentially day length neutral selections but did not follow up. Seems like the gardeners with the most success are in zones 8 and mostly 9. 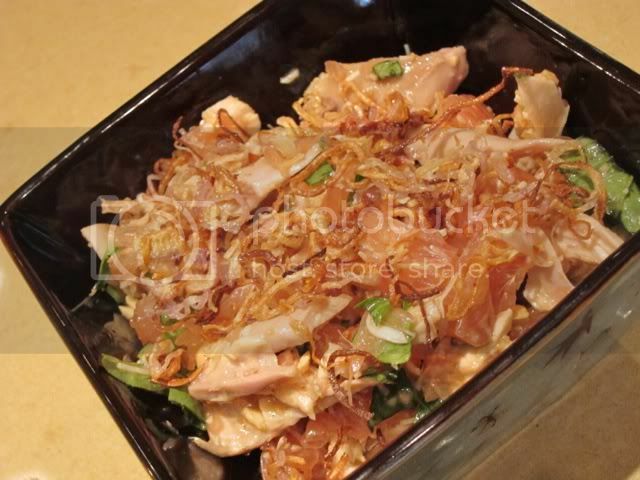 I've also been really into variations of pomelo salad. 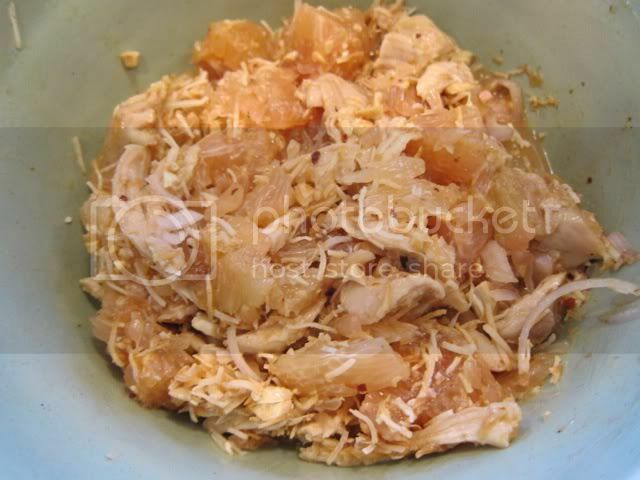 I've been using the coconut milk/nam prik pao/palm sugar/fish sauce/lime dressing (used for wing bean and banana blossom salads) even though I'm pretty sure it's not traditional with the pomelo. To grind the dried shrimp in some recipes...I do not have a coffee or spice grinder. Can you use a mini cuisinart or a bullet type chopper?